Just made this hat from the pattern at http://neannersshop.blogspot.com/ - Can't you just picture it for newborn photos? I love it! How awesome of her to share this pattern! i have both of those variegated yarns but tend not to be a fan of them...they look great in that basketweave pattern, though. Now i know what to do with them! ETA-i didn't mean that in a bad way, i bought them because i loved them. just that when i tried using them i didn't like how they turned out and they are beautiful this way. adorable! we have two boys and a baby girl, so i feel you. that is gorgeous! what a great idea and a beautiful quilt! you are welcome! i pulled the apple and apple slice from your wists...the star is cotton too (lion brand baby's first...so soft and smooshy! ) 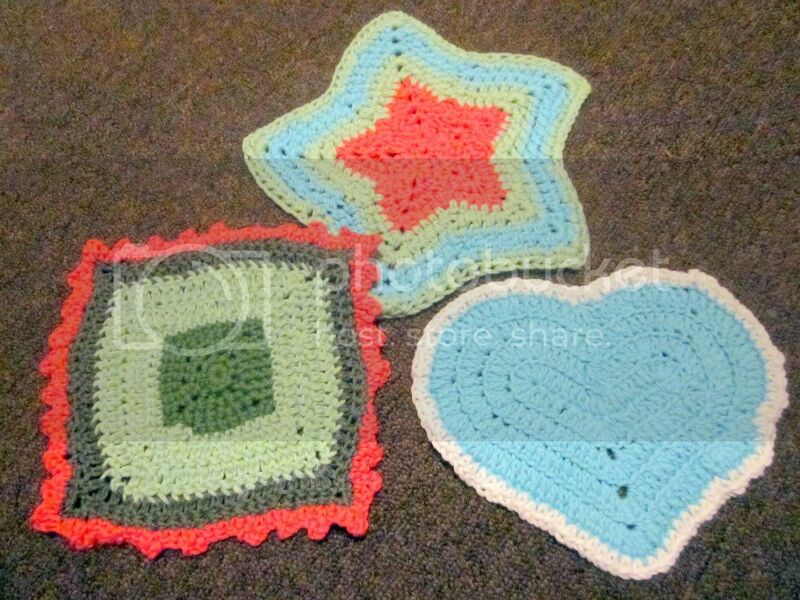 and actually planned on being for your son (based off the star blanket in your wists as well) but it would make a nice potholder and if he already claimed the puff i would say you are all set! Here is my beautiful package from IdlersDesign. The cloths are so nice...they are made from an antibacterial cotton, how cool is that?! I told her that I was joining this (at least partly) for my mom because she loves knit and crocheted dishcloths and i don't make them for her nearly as much as i should. The only problem is that i am going to have a hard time sharing these! 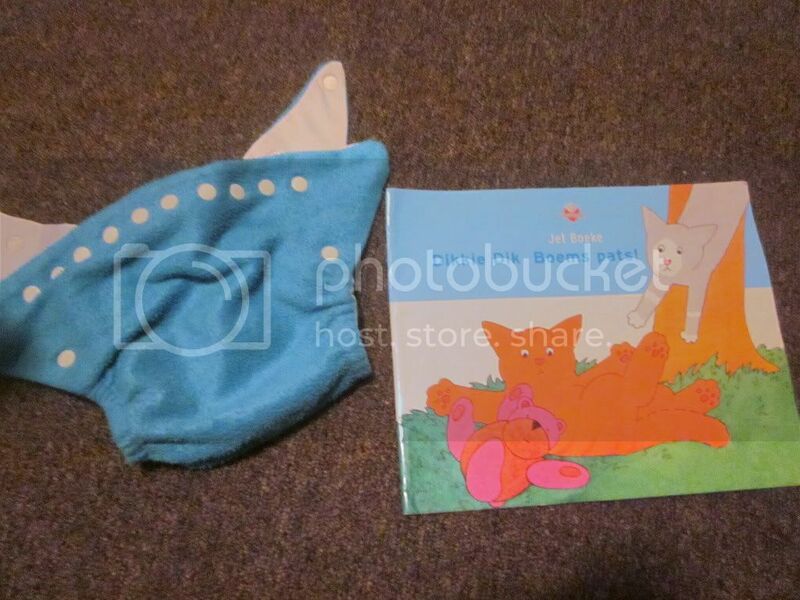 Then she sent a couple awesome extras...a cloth diaper (i have never tried anything fancier than a plain cloth diaper and pins) and a childrens book...my partner is from the Netherlands as are a couple people close to us so this will be wonderful for the kids to share with them (and entertaining to listen to me reading in a language i don't know)! Thank you so much for such a great package! 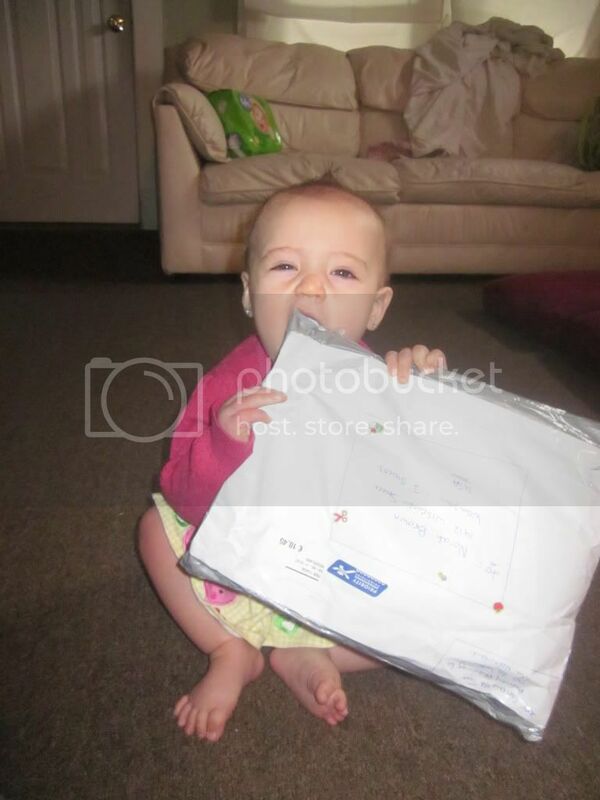 Here is Rosie helping open the package. Who needs scissors? They are both so cute! and mad props to you on the homemade bias tape. i sew a lot and have forced myself to reach a comfort level with it, but bias tape is really my mortal enemy. Beautiful cloths and I adore those napkins, too! such pretty cloths so far! i am inspired to work on some more...Christmas presents, maybe? ouch. i hope that things get cleared up! i am finished so will prob. pack things up tonight and send tomorrow.